Here is our album of "baby pictures", better known as New Arrivals. This is the "older" New Arrivals page; stuff I've gotten prior to 2002. On the left is a H.G. 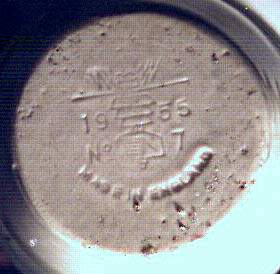 Co. CD196. Wonder why most of these are busted. 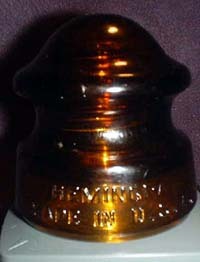 In the middle is a Hemingray CD175, usually nicknamed "The Doorknob". California CD145 in sage green, and parts of CD168 in amber and an amber fishing ball. 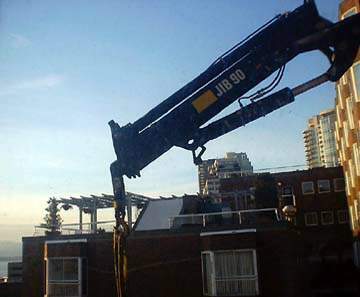 I just hope they're careful with that thing. My lovely waterfront view... turns to garbage! A garbage disposal tube, that is. 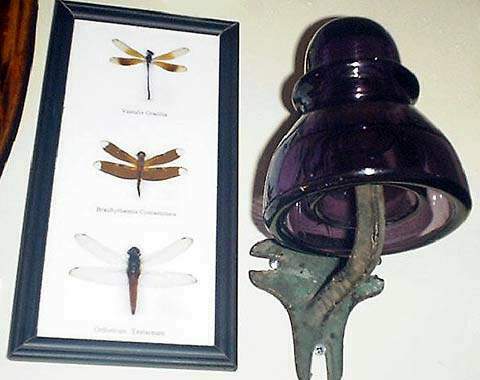 Insulators and bugs? Why not? This trio of dead dragonflies gets along fine with an Agee 30 that has a stick up its %@*#$! Two of these came from the potluck, and one is fresh from the cleaning bucket. Left: H.G.CO. 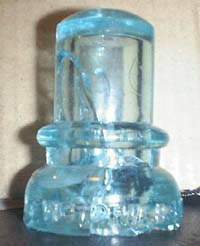 CD145 in a pale cornflower or cornflower/steel blue mix. 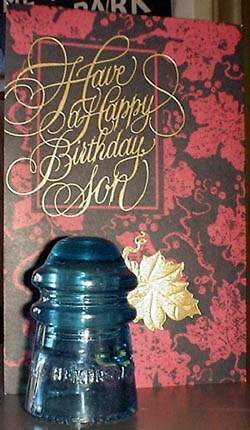 Center: Windex blue base embossed Am. 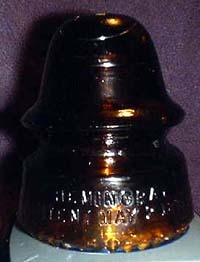 Insulator Co. CD145. 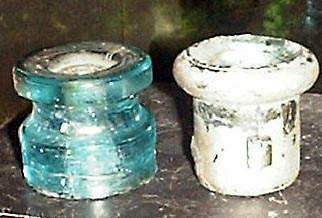 Right: Lightning rod insulator in a pale aqua, finally stripped of paint. 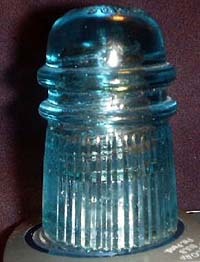 Here is my first cobalt insulator. 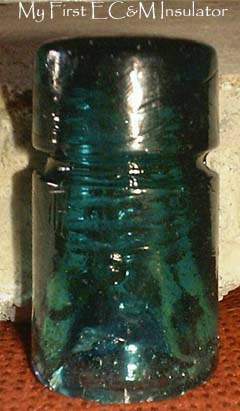 It has an exceptionally bright, clear appearance unlike any other cobalt insulator I've seen either live or on web pages. Most of these seem to have a kind of dirty, dinghy appearance; this one is extremely clean and has a very bright, rich cobalt blue color. I'll be paying on this one for a couple of months, but it will be WELL worth it!! Here is a Columbia #2 L.S.V. in the CD262 style, in a sweet color I would call "ice cornflower blue". 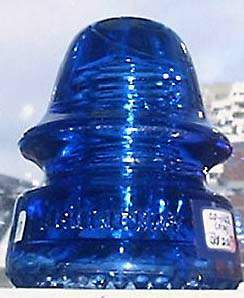 These commemorative insulators come in a variety of colors; however I have heard this is a tougher color to find in this piece. This is one of my ebay finds, one which I had to take "anti-sniping" measures to acquire - as it was rather popular. 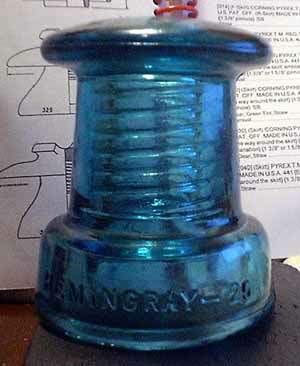 But nothing took more effort to get than my Hemingray E_14B in light opalescent. Talk about having to sit on an auction - it was clear a lot of people really, really wanted that insulator! This beautiful old girl is a CD735 Mulford & Biddle threadless. Sure, she's bashed, missing some skirt glass, and she's been repaired - but this tough old gal stands up on her own and displays acceptably well from the U.P.R.R. side. What makes this special is that it is my very first threadless insulator. I'm probably going to just sit on the couch and gawk at the thing for awhile, until I get used to seeing a real live threadless in my window display! I'm sure she'll look even better once the sun comes back next May! Here is a very nice CD214 Hemingray-43 in a beautiful, rich 7-Up green. This old girl was languishing in a basement until I put out a rescue call for abused and neglected insulators, and the adoption agency called a few days later to tell me of this pretty gal they found. Now she has a new home amongst other adoptees, and is quickly making friends with some purple Californias and an injured W.G.M. Co purple beehive. 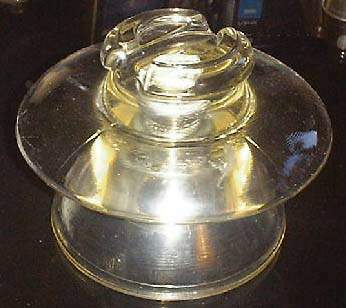 An attic spool insulator and a LRI. I thought these things only came in brown or white porcelain. 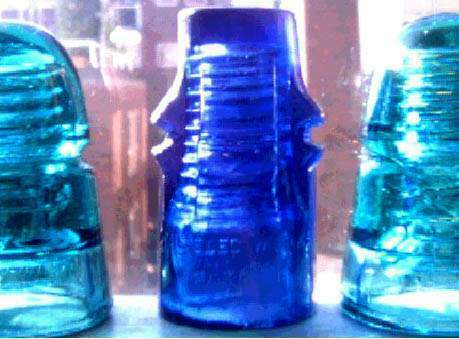 Imagine my surprise when I saw these in aqua and light blue glass for the first time. The one on the left is a CD1087 "B". 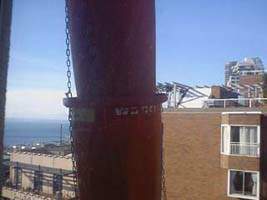 The painted-over piece is an example of a "side tab lightning rod insulator" (LRI). 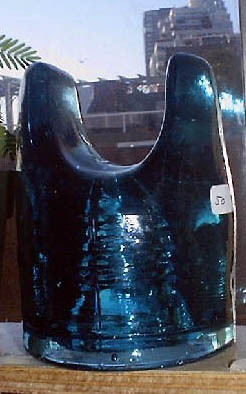 This is one example of more than 130 styles of these that come in glass. 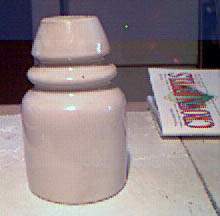 Later, porcelain was used; and they were made until around 1940. Once I figure out what will take the ugly silver spray paint off, I'll get some better pictures of it. And here it is... a very pretty pale aqua LRI. A few days in the cleaning bucket took care of her! LEFT: I never thought I'd ever really own a CD123 EC&M !!! But there is is. It's fizzy & steamy inside, so it's very pretty to look at when illuminated. 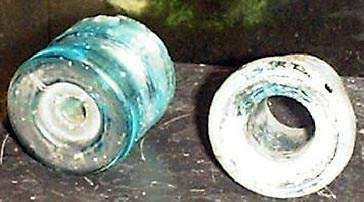 RIGHT: Who says that a "common" insulator can't be special? My mom in Alaska sent this cute blue Hemi-9 in my birthday box. 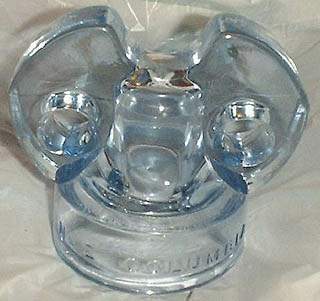 If I had to pick just one insulator to save during a disaster, this is the one. A very pretty peacock blue commemorative showed up today. It's the NIA 2000 commemorative, and is my first. Carnival suspension insulator hanging from my green Enumclaw disk. Cal. Elec. 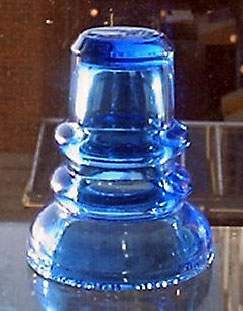 Works CD130.1 in cobalt blue. 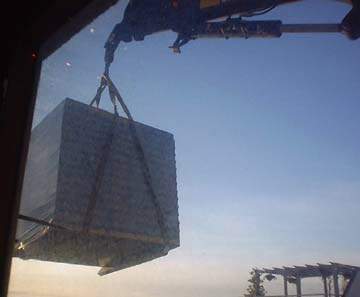 Seven lucky little B-hives, seven spaces for them now go in the window. 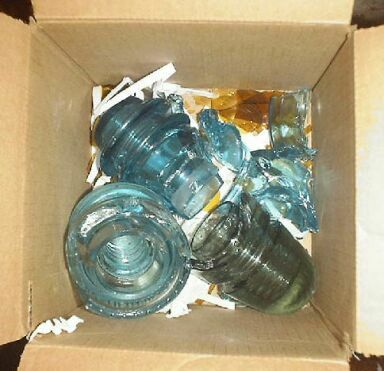 Sometime you might be fortunate enough to come across a group of insulators that are inseperable. 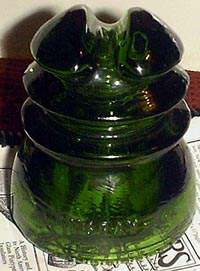 Insulators that once lived together on the same line, insulators with "pedigree papers" showing their true origins. These seven little beehives are just such a group. 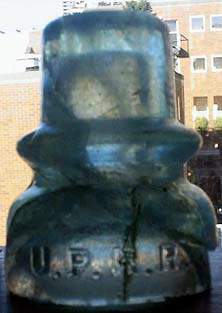 Found in Port Jervis, New York, these insulators once served proudly on the Deleware and Hudson Canal, a primary coal transport waterway from Pennsylvania to New York. 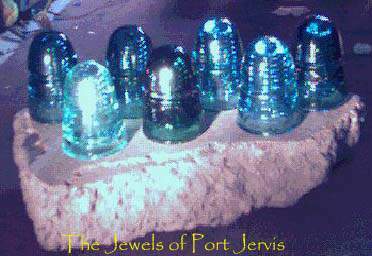 Telegraph lines used on this canal were insulated with these wonderfully transparent & colorful jewels. 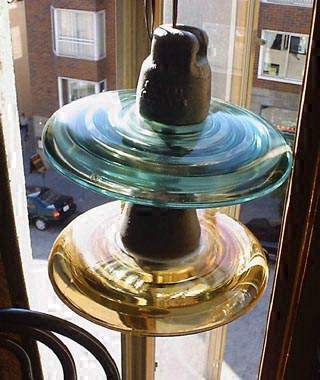 Knowing the history behind this group of insulators makes them that much more special. 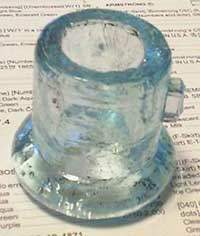 It isn't often that there is printed proof of where an insulator served its duty, so if you should come across something like this, consider yourself a very lucky insulator nut indeed. Click the jewels to see a full-sized picture of them. My personal thanks and gratitude go to John Ceccherelli for the seven beautiful beehives and for the story behind them. of some kind, circa 1950s. The embossing on the top confirms it. with our discussing our pet rats! Who woulda thunk it? 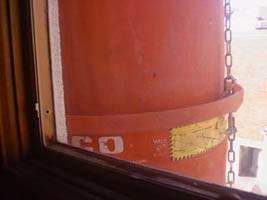 pinhole that isn't threaded until it's in the dome area, way up inside there. I've been told this type of insulator was usually cemented to its pin, which is why the threads are so far up inside there. The inner skirt is also very long, attaching up inside the dome area as well. 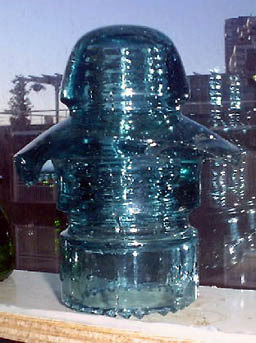 This insulator has a very long leakage path for those rainy British winters.